Classic carnival game DUNK TANK with see-through window. With a dunk tank rental from Bella's Bouncies you can dunk your boss, principal, friends, parents, co-workers or even your kids! 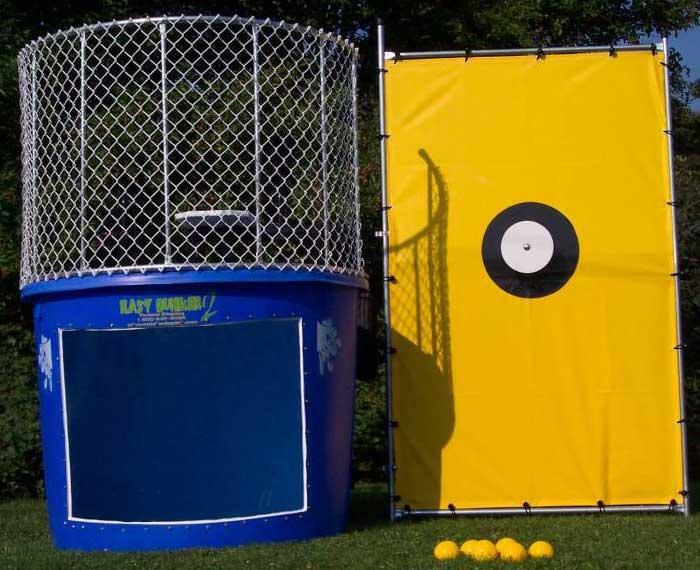 Players toss softballs at the dunk tank target, if they hit the target on the dunk tank, splash in goes the volunteer into the dunk tank filled with water! The fun never ends with a Dunk Tank Rental from Bella's Bouncies. Great for school or church fundraising events! Dunk tanks are a carnival original. A dunk tank rental from Bella's Bouncies is a sure way to get soaked while having a good time! Dunk tank holds 500 gallons of water and takes 1 hour to 1 1/2 hours to fill completely. Max participant weight is 250 pounds. You need a 6' opening if you have a fence. 3 balls provided. Missing balls will be charged $10 each.